With the fall and winter holidays just around the corner, people who will be hosting a holiday get-together will be on the hunt for a business where they can quickly and affordably get the party supplies they need to make their events special. 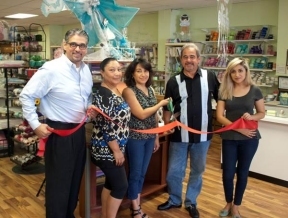 Mil Artes, located at 6306 26th St, is Berwyn’s newest arts and crafts shop, offering materials, creative services and craft classes for all occasions. In partnership with the City of Berwyn and Berwyn Development Corporation (BDC), Mil Artes held a grand opening celebration early this month. Mil Artes stocks all manner of material, including ribbons, balloons, invitations, party favors, center pieces, table decorations, corsages, and more. Mil Artes is open on Monday from 12:30PM – 6:30PM, Tuesday-Friday from 10:30AM – 6:30PM and Saturday from 10:30AM – 3:30PM. For more information on Mil Artes, visit www.mil-artes.com.